Long weekends are the best! I think 3 day weekends should be the norm. You just feel so much more refreshed having another day off. Although ours was spent traveling, it was still nice to start the work week on a Tuesday. This past holiday weekend we went to visit some family in Richmond, VA. 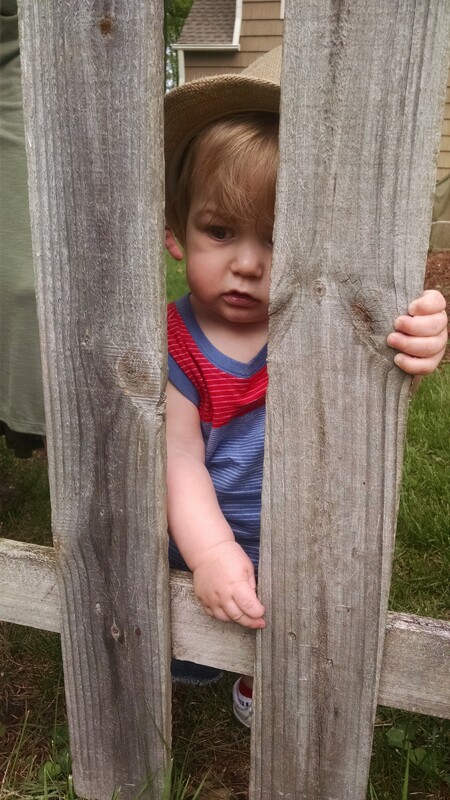 This was Owen’s first trip to Virginia, and he was able to explore a bit. 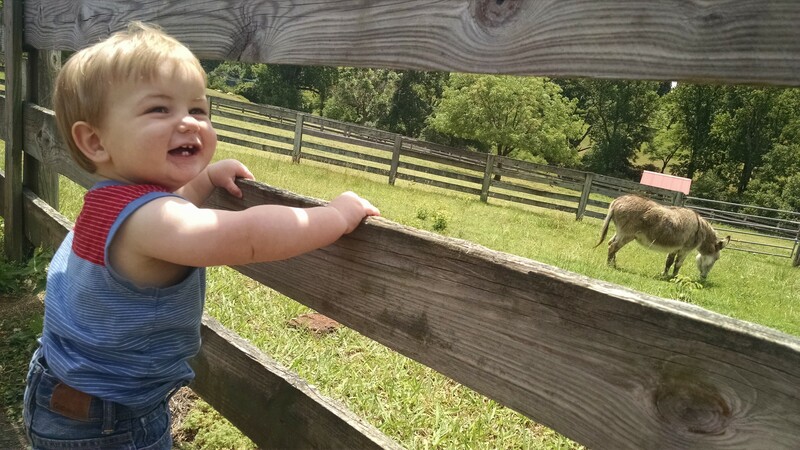 He loved Maymont Park where he was able to see some animals up close. Seeing his reaction to the animals makes me happy that we recently got a membership for the Columbus Zoo. We also checked out an indoor play place called Coffee and Cartwheels that served coffee for parents. 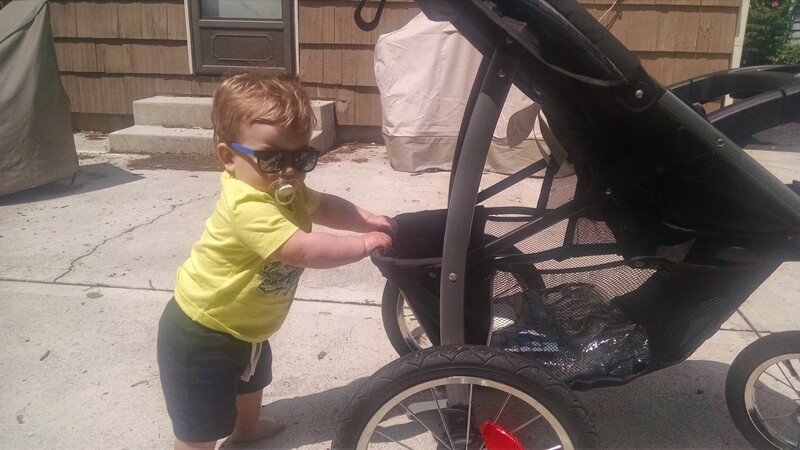 While mommy and daddy enjoyed some café au lait Owen was able to play around. Other than the loooong drive we had a good time visiting and meeting new people. I know I am a little late in saying this, but I hope all the Moms out there had a relaxing, fun Mother’s Day. I know I did :). On Mother’s Day we didn’t have any plans, but sometimes those days work out the best. Tony made us breakfast and let me relax and read. 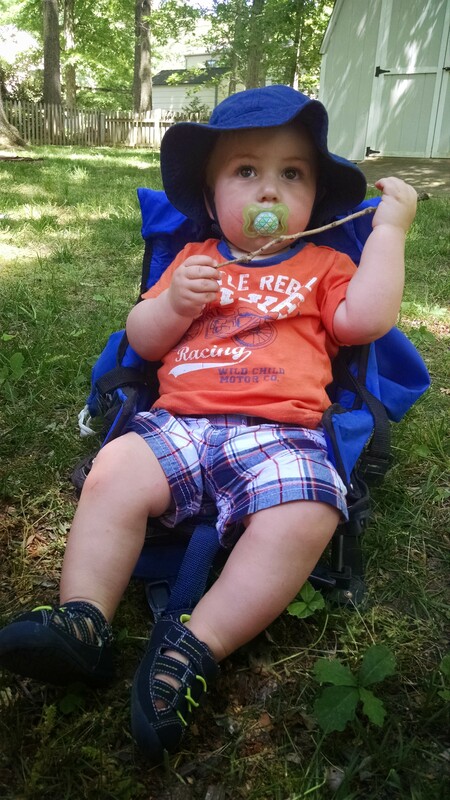 It was such a nice day that we took a few walks around the neighborhood and relaxed in the backyard. Owen gave me a few gifts; he took a 3 hour nap, and got me a gift certificate for a facial (because he knows how much he is aging me). I am beyond thankful to have a happy healthy boy and a loving husband. Thank you both for a great Mother’s Day :). 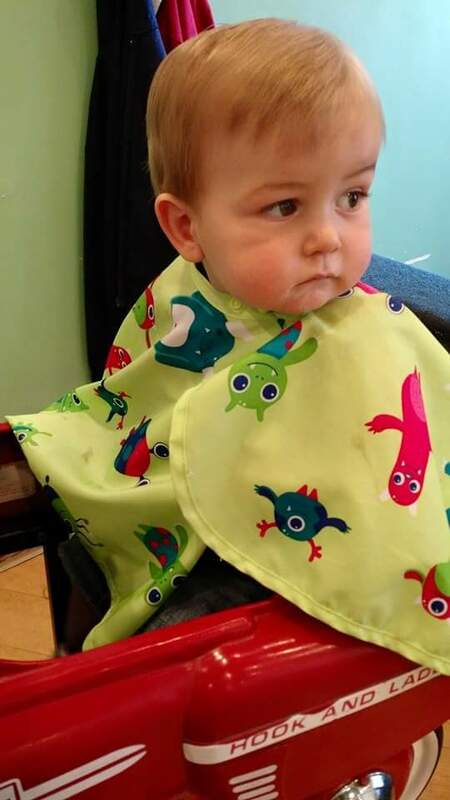 Tony had been pushing for us to take Owen to get his first haircut, and I had held out as long as I could. His hair had been crazy and really getting into his eyes. I knew after getting it cut that it would change the way he looked, but I didn’t realize how much. Finally on Saturday afternoon we went to a salon that specializes in children’s haircuts. We wanted to make sure that the first time was special. They had a play place, video games, and every cutting station had a TV and a different type of car for the kids to sit in. 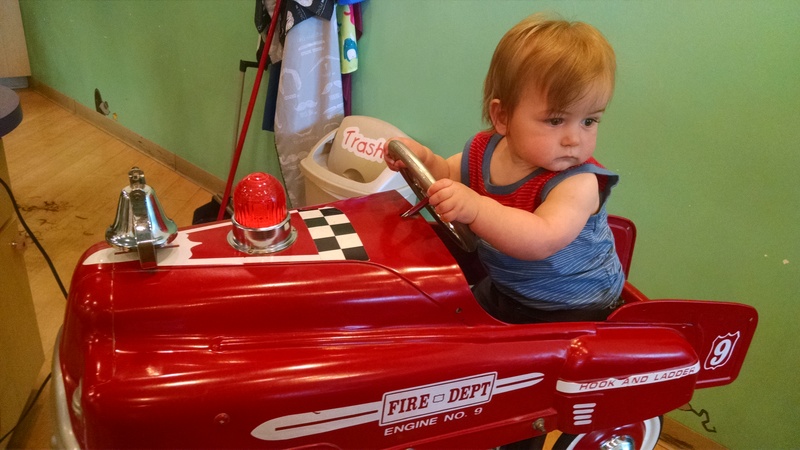 Owen was a little skeptical when we first put him in his firetruck chair, but soon enough he started to play with the steering wheel. Then the stylist came over and put the cape on him and he wasn’t sure what was going on. The stylist asked us a few questions about what kind of style we wanted. We just told her that we wanted to try and avoid the classic bowl cut that you see in old pictures. After wetting down Owen’s hair and brushing it she started to cut it and not ten minutes later she was done. I guess you have to speed cut when dealing with children. While she was cutting it she starting singing the ABC’s. It was kind of cute. Owen kept turning his head to try and take a peek at what she was doing. So she did more of a side part cut with some layering. We got the first hair cut package which including his picture and a lock of his hair on a certificate. He looks like a little man now rather than a baby. He is growing up so fast :(. This past weekend was the first night I spent away from Owen, and I picked a great weekend to do it. The weather was amazing! I don’t know about you guys, but it has been so nice to feel the sun again :). I am enjoying the warm weather we have been having this past week. This weekend I enjoyed some pampering and time with a few of my friends. We started the day with getting our nails done. Unfortunately they didn’t do that great of a job – my finger nails started to chip the next day, but my toes are still looking good. Just in time for sandal weather! In the afternoon we went out to lunch and did some shopping. I almost forgot how much fun it is to have your friends around while shopping. It’s so nice to have other opinions and people to grab another size while you are in the fitting room. After we were shopped out (not sure if this was the case or if we just needed some caffeine) we decided to go back to the hotel. There we got our swimsuits on and decided to have a drink out on the patio because the pool was indoors and really humid (side note: you can’t have glass in the pool area so we were really classy drinking champagne out of Starbucks cups). After talking for a bit it was time to get ready for dinner. We enjoyed some more drinks and yummy sushi. The night didn’t end there. We had one last drink out, and then came back to the hotel and enjoyed yet another drink in the hot tub. Looking back no wonder I felt crappy the next day. I am not used to drinking that much. It was a great time and I am glad that I was able to enjoy my first night away from Owen. Thank you Tony for being such a great dad :).